Plaintiffs filing lawsuits over noise pollution from military bases repeated Gambaro! (Let’s keep doing our best) three times at 3:00 p.m. on September 18 at Akishima City Hall, Tokyo. 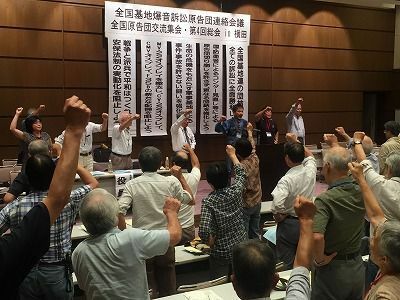 The National Liaison Council of seven groups of plaintiffs filing lawsuits over noise pollution from military bases held its 4th general meeting on September 18 at Akisihima City Hall in Tokyo. The council adopted a resolution to oppose military bases’ violation of human rights, peace and democracy. The resolution claimed residents who were protesting against construction of U.S. helipads in the Northern Training Area in Takae, Higashi, were attacked violently by the government. The resolution, referring to the government deploying more than 500 riot police and blocking a prefectural road, condemned the hardline response as ” an act of violence”. It claimed the government was acting under martial law without providing any legal basis for their action. Touching on a case where reporters were forced out and placed under restraint temporarily, the resolution indicated that police power was being used to limit freedom of the press. The resolution also criticized the government’s stance on forcing through the plan to build a new U.S. base in Henoko, Nago, as part of the relocation of the Futenma airfield in Ginowan. The resolution will be sent to the government.